Read "Tubes Mechanics & Mystique" to understand a musician's love for tube amplifiers and why they are still used today. For care and maintenance of your tube amplifier read "Tube Amplifier Care and Hygiene" and "Survival Tips for Tube Amps"
Here are the schematics to the greatest all-tube guitar amplifiers of all time. These designs are an inspiration to musicians and amp designers because of their simplicity and sound quality. 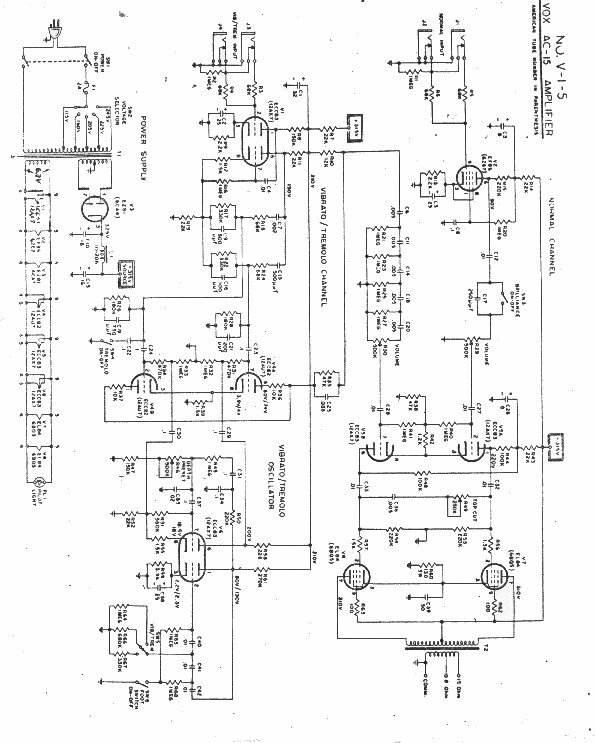 Here are the schematics of great amplifiers from other web sites. Stromberg-Carlson Just because dad had one! Modern demands upon a musician's sound quality and flexibility have led to the following designs. First of all, MOSFET amplifiers are a much better choice for high fidelity and power amplification. However, the tube amplifier provides a better tone and sound quality for instrument amplification. There are several reasons for this. The tube preamp is better suited for impedance matching of the guitar pickup. Transistors are noisier compared to tube circuits that can achieve a better signal to noise ratio. When the tube amplifier is "overdriven" by transistors, the transistors can really be heard. An all tube design is needed for a clean sound. Thus, noise gates were invented. A simple straight forward tube amplifier design works best for guitarist. Multiple guitar sounds are needed especially during live performance. In a recording situation, a simple tube amplifier works great because effects should only be used during mix down. Multiple guitar sounds are needed especially during live performance. An effects loop is a necessity. This signal path does the trick. PREAMP DISTORTION- Tube distortion has far better tone and sound quality than transistors or DSP ( digital signal processor ) distortion. When a tube amplifier starts distorting even order harmonics are introduced, smoothly squaring the signal. Distorting transistors add odd order harmonics to the sound. To simulate the tube distortion the signal is usually "clipped" abruptly to distort the signal. DSP distortion is achieved by adding a wave form to the original signal (usually a square wave). A tube preamplifier can be set so when you play a string soft there is a cleaner sound and when you pick hard there is distortion yielding more "human control" of the sound. AMP/SPEAKER DISTORTION- Ah that blues sound. Listen to great blues musicians. There is distortion but not like killer heavy metal distortion. This is because the distortion is mostly from the power tubes being overdriven and the output transformer saturated. Preamp "clipping" distortion is kept at a minimum for a blues sound. The nice thing about power amp distortion is the compression and sustain that can be achieved. TURN YOUR AMP DOWN- Sound engineers and band members have to compete with guitarist on a 100W Amp. Unfortunately, "cranked all the way up" is the range that tube amplifiers sound the best. This drowns out the vocalists and gives the sound engineers a bad hair day. Ideally the sound engineer needs to be able to control the levels of all the musicians during a live performance. When the guitar amp is cranked up the level at the mixing board is usually turned completely down. This is because the blasting guitar amp is being picked up by the vocalist microphones. The sound engineers have little control over the guitar "mix" and of course the producers hear all about it! In the studio, it is hard to record with the amp levels at "10", because it is difficult to record and hear the headphone playback. O.K I'll admit I have a 1989 Marshall 2203 100 W Master Volume and even pulled tubes out to get that sound at a lower volume. CONCLUSION- Design a small all-tube guitar amplifier with a tube preamp for "clipping" distortion and an effects loop for today's sound requirements. Because digital rack mount effects are in stereo, a dual tube power amp with a guitar preamp is ideal. - The sound engineers will be nice to you. - Lead singers will tolerate you. - And the dog will quit running away during practice.